Facebook is not a one size fits all type of marketing. They give so many options on various items that it tends to confuse a lot of people especially those who may not be quite as technical as others. Before we get into how to create an ad let’s just remember some basic marketing principles. These principles apply no matter what platform you are using. Facebook is really no different than direct mail or billboards or T.V. You have to address the same issues and use the same psychology. Problem – Agitate – Solve; Regardless of what you are selling or promoting this is arguably the best marketing advice ever. Identify your markets problem, give them something to think about as to why it’s an ongoing problem and then provide the solution. Validate your idea – You can have an awesome idea but if no one is willing to buy from you, it does not matter how wonderful your whizbang gadget or coaching program is. Your Message has to match your Market. You not only must have a great product or service but you have to be able to identify the ideal market and be able to reach them. The good news is Facebook can reach most markets but the bad news is you are interrupting their ‘escape from reality’ time so you need a very powerful message. You must have a unique selling proposition which can be summed up in one or two sentences. This is what differentiates you from competitors and gives the potential customer a reason to buy from you instead of them. 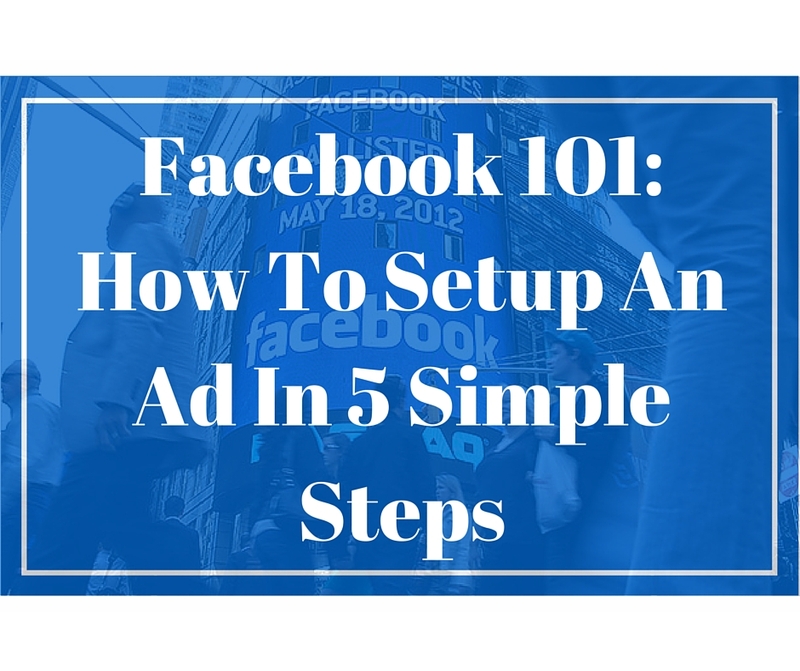 Let’s get down to the ad itself and how to get going with Facebook. Like all other marketing you want to begin with the end in mind. What exactly do you want your potential customer to do? 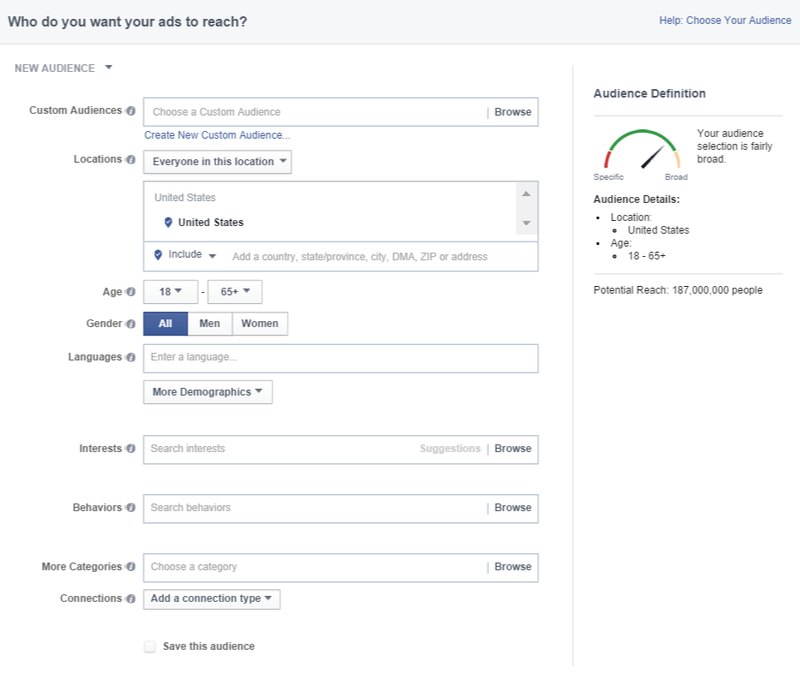 Once you know this you can create a Facebook ad customized for this objective. Now essentially there are two ways to start a Facebook Ad. One is through the simpler Facebook Ads Manager and the second is through Power Editor. The Power Editor provides more options and allows bulk editing. Since we are trying to get your ad up and going quickly we will focus on the Ads Manager. If you want additional information on the Power Editor I’ll be glad to notify you when my updated complete guide to using the Power Editor is ready by going here. 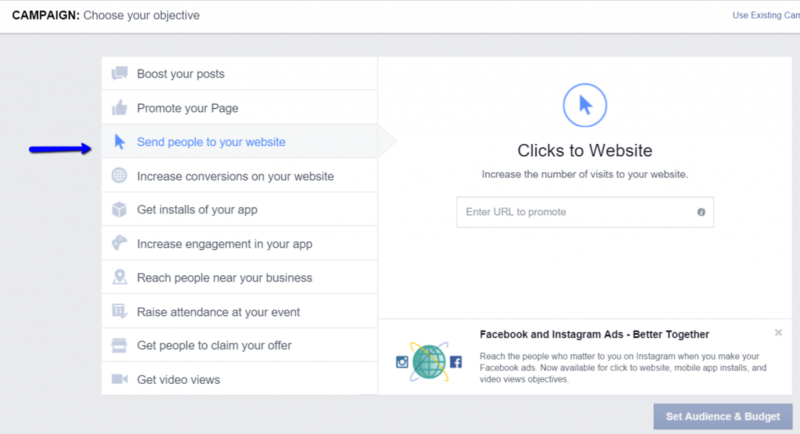 Step 1 – Go to Facebook Ads Manager and choose your objective. Facebook does provide 10 objective options. 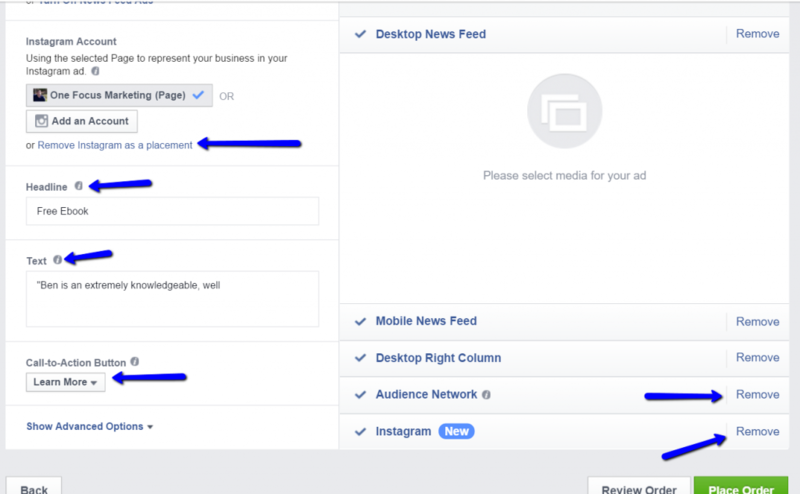 When you select one, this will let Facebook know which Ad Options to give you later on. Hint: By far most of the time selecting Send People To Your Website is going to be used the majority of the time. It is sort of a ‘catch-all’ selection and gives you the ability to get the potential customer out of Facebook and into your world. For our purposes here we will use the Send People To Your Website option. This will now open up an area to enter the URL of the website you are promoting. When you enter the URL you will have a chance to name the campaign and add your tracking ‘pixel’. If you don’t know what a pixel is or don’t have one setup it is not necessary. Step 2 – Setup your audience and your budget. Remember when we talked about message to market matching. Here is your chance to define your target audience. For now you will ignore the option at the top ‘Custom Audiences’. This is an advanced technique but another one you will want to learn at a later date. Interests – What pages they have liked, what their activities and interests are. Behaviors – Purchase behavior and intents. Select your location, age, gender and there are a ton of other demographic options should you need them. Also, from here you can input interests and behaviors by just free from typing or there will a menu selection to narrow your audience. You should note that even though there are a lot of options not all options are available for all countries. When you start the selection process if you change the country this may restrict or eliminate the use of certain behaviors or demographics. Once you have defined your audience there is a check box so you can save it for future use. It’s always good to save it for easy reference and implementation of your next ad for this group. Next is your budget which can be either daily or lifetime. Typically daily will be better initially and then you can select your schedule so you can run it for a few days and evaluate your results. Optimization will be defaulted to Link Clicks to Your Website which is fine. Then you have a choice on Bid Amount; either Automatic or Manual. Automatic lets Facebook set the bid. Manual allows you to place a bid based on what they are worth to you. Ad scheduling can only be done if you have selected a lifetime budget. This can be useful if you are say targeting to people who work 9-5 and they won’t be able to see your ads until after 5pm. For your initial ads you can just leave it set to ‘Run Ads All The Time’. Delivery type can only be changed from standard if you are using a manual bid. 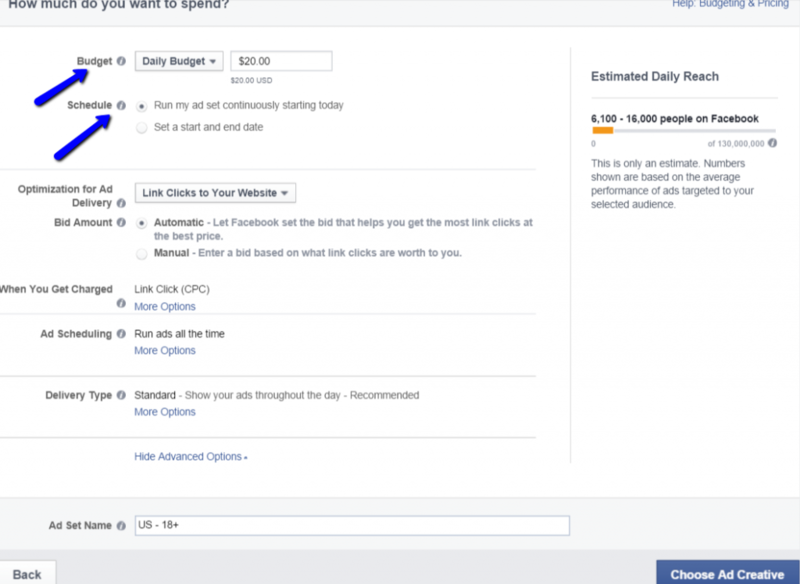 Standard allows Facebook to space the ads throughout the day. Accelerated shows the ads as quick as possible. This is important if you have something time sensitive and want to get the ads out as quick as possible. This will also use up your daily budget quicker. Now you are ready to name your ad set and click the ‘Choose Ad Creative’ button at the bottom. From here you are selecting whether or not you want a single image or a video or if you would like to input multiple images. Most of the time a single great image will do just fine. A good rule of thumb is if the people you are marketing to have little or no idea who you are, you can leave a picture of yourself out and opt instead for something more indicative of what you are promoting. Even if you are a coach or consultant this holds true. Once you have selected an image you can scroll down and will then input a few things which I want to go over in some detail. Connecting your Instagram account – This is a relatively new feature and for your first ad I would leave it out. Marketing to people on Instagram does not have enough data to know if it will be effective as a general tool. Save your money for now and use it just toward Facebook. Remove Instagram as a placement as show in the image above and also remove on the bottom right along with the Audience Network. You can keep the Desktop Right Column but often it does not yield nearly as good of results as the News Feed. Step 4 – Next up is your Headline – It must be compelling. Do not put a lame headline with some vague generalization. Be specific and be bold. Asking a question is good. Now input the Text of the ad. You can be kind of wordy here. Using bullet points or a numbered list outlining the benefits to your customer is where you should focus. You don’t want to talk about how awesome your product or service is. Only state the benefit to the customer. Selecting a Call to Action Button: You can expand this and get several options. Pick the one that applies to you but if you are unsure, choosing ‘Learn More’ is a good all-purpose button. Once you have completed this you can choose some advanced options which will allow you to put a little more text into your ad and a couple of other things. However, you can really skip that for now and just hit ‘Place Order’. Guess what? You’re done creating your first Facebook Ad. You do need to check on your ad to make sure it got approved. Facebook will send you an email to whatever email address they have and let you know. Typically these are approved or disapproved within a few minutes to a few hours but sometimes can take longer. Don’t get discouraged if you don’t see a response instantaneously. Never-the-less once it is approved and running you are all set from a creation standpoint. You don’t want to forget the crucial part of following up by checking on how your ad is doing. There are a lot of numbers out there- metrics as the fancy corporate types call them but most do not really mean much for most. CTR (Click Through Rate) – The number of people who actually clicked on your ad. Conversion Rate – The percentage of people who see the ad to those who clicked. Hint: You also want to know how many people clicked on your ad versus how many signed up for your product or service. You can then determine your return on investment and also you will now have a ‘control’ to measure other ads or landing pages against. Don’t forget to learn some of the advanced techniques I mentioned and improve your skills by practice inputting more ads. Also, it would really benefit you to learn some basic copywriting skills and how to write a compelling headline. There are some great resources out there and tons of great information. Some of it does not work as well as others so before I actually use information someone is giving I ask about their success. Specifics! Just contact me before you do the ad so I can get some basic knowledge of your market and product or service. Some great advice for a new blogger like my self! Enjoyed this tutorial. Clear, precise and gave me some great ideas. Thanks for the article. I just started experimenting with FB ads for the first time a few weeks ago. I’m really interested in reading your follow up post on the more advanced settings. Appreciated all the detail & screen shots you provided! This is a great way to drum up support. I have used their ads on a few occasions. Great article packed with really good ideas. Thanks for sharing. Great information. Thanks for the tutorial. Thanks for breaking this down! I haven’t tried Facebook ads yet, so this tutorial was very helpful at helping me determine what I’ll need to do. Lots of great info here. I like what you have to say and the infographics you used. Keep up the great work and live unstoppable! Suuuuuper helpful! Great walk-through. Thanks so much for sharing! Thank you. I must admit, I am very proud of it. What an awesome tutorial. I’ve been entertaining the idea of using Facebook ads, but didn’t really know how to do it. Thanks to you I feel fully prepared to take the plunge! Brian, thank you so much for this post, It was very informative. I appreciate the screen shots too. You have awesome content! Great tutorial Brian, very easy to follow. I haven’t done much Facebook advertising yet, but I’d like to dive in in the near future. Great tutorial. I have done a few ads and they can be a little confusing. This is great for someone who has never done one. Thank you for this! I need to do do this. This is very helpful, I knew nothing about how to even start this process! Love any post with visuals like this to aid my set-up. Excellent article, will definitely come in handy when I’m going to advertise on Facebook! This has been very informative! I haven’t yet used ads, however will be doing so in the future! I do this about 10 times a week at work lol you did a great job of breaking down the steps simply! Thank you so much! I have paid for some Facebook “boosts” in the past but this is a much, much better tutorial that I could have used! I will try it again soon – pinned this too! Thanks! This is so helpful! I always wondered how this worked. I may give it a test run sometime. I did this in the beginning to promote my page and it really did help, FB ad’s are a great way of raising awareness about your page. Wow this is the most helpful tutorial I have ever seen about facebook ads. It is very helpful. I just started advertising on facebook! We have been for long time planning to setup a fb ad. This post is very informative with precise steps, bookmarked for future reference. Thanks for sharing. This is just what i’ve been looking for.Very Helpfull!Thanks! Such great content. Love that it’s a free tutorial too. I’ve thought about using facebook ads before. Thanks for sharing this awesome free tutorial. I have been looking for this since so long! Very helpful information. There are just so many options. It is important to check in on your ads because sometimes I do the same way and it isn’t doing as good as other times and I can’t figure that out yet. Loving the guide! It is so straightforward without losing detail. Thanks!